The Government’s radical new public health strategy offers an opportunity to extend occupational health into primary care and improve links between GPs and OH practitioners, NHS Plus has said. In its response to the Government’s White Paper Healthy lives, healthy people, NHS Plus has argued that OH could play a much greater role in helping to communicate public health messages, whether around health emergencies, such as a potential pandemic, or simply more mundane issues. The White Paper, published in De­cember by the Department of Health, argued that employers had a central role to play in encouraging better public health. Health at work is set to be one of five “networks” set up this year as part of a new “Public Health Responsibility Deal”. 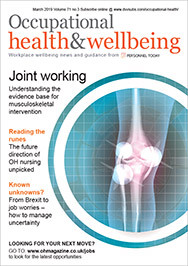 The Government’s proposed Public Health England service should “develop a workplace implementation strand that links occupational health with primary care in order to maximise effectiveness of response”, argued NHS Plus. The strategy also offered opportunities to develop improved occupational health provision in primary care, by providing high-quality occupational health advice and support to the staff of primary care teams and to the patients being treated in GP practices, said NHS Plus. “The aim would be to maximise productivity in primary care and to promote employment of patients, with regard to improved workplace health and wellbeing, rehabilitation back to work or assisting the unemployed,” it argued. A more integrated “health and wellbeing service” would provide scope for targeted health education and health screening to address important avoidable diseases and illnesses. Workplaces could also act as a vehicle for the delivery of more subtle health messages, such as promoting physical activity as something that is fun and inclusive or encouraging people to change their dietary choices both in and outside of the workplace. At a practical level, however, there was also a need to improve the range and utility of data collected in the workplace about the health and wellbeing of workers, with a need for better integration of the various IT systems used by occupational health services and by primary care. “There is a lack of integration of data collection between workplaces. Large employers, such as the NHS, local authorities and selected private companies are in the position to collect data on health conditions with a view to identifying options for intervention and support, with particular emphasis on promoting work ability,” NHS Plus recommended. “By collating information about chronic conditions and linking it to accident data or sickness absence data, health interventions could be targeted to improve health and wellbeing and employability. Care pathways for chronic conditions should include workplace aspects such as monitoring and rehabilitation. “From a commissioning perspective, shared data from all large employers in a locality, supplemented with data from smaller employers and the voluntary sector, where it exists, would inform the planning of support of people with chronic conditions,” it added.